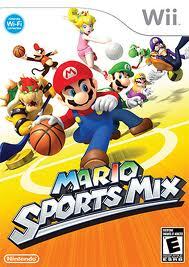 Mario Sports Mix for the Wii. Rated E for Everyone. From Nintendo: MARIO SPORTS MIX presents these four familiar sports – but with a Mario twist. Players can choose from a variety of playable Mushroom Kingdom characters and can even challenge Mario and friends directly by playing as their own Mii™ characters. Each game contains a number of Mushroom Kingdom power-ups that can turn the tide of a game in an instant, such as banana peels, green shells and even mini mushrooms. In over-the-top Mario sports fashion, each character can unleash his or her unique special move that ranges from Mario’s fire dunk in basketball to Yoshi’s rainbow attack in dodgeball. Leave a comment below this blog telling us why you want to win this game. 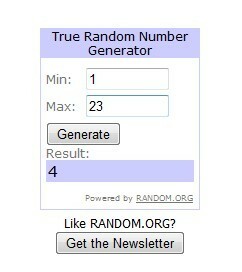 One winner will be selected by Random.org. Friday, February 4, 2011 at 8 PM ET. Note: MommaSaid received no compensation for this post, just the game, which we decided to give away. Because that’s how we roll. 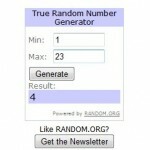 Joanna M: You’re the winner! Look for an email from me. Thanks, everyone, for playing along so nicely. I have three Mario nuts in the house who always school me at Mario Kart. And since we have had so many snow days here in the Northeast, I would love to be prepared for the next one! I’d love to win this because I only have a couple of Wii games, and this looks like a lot of fun! I would love to win this for my Nephew. He would really love this game. Looks like so much fun. My boys love Mario and they love Wii Sports, so I’m certain they would love this game. We haven’t had any new Wii games for a while–the budget’s been tight and they are currently saving their allowances for long-term goals, so this would be a nice treat for them. I would love to win this game because it looks like so much fun! I’d love to win this for my girls since they’re such big Mario fans! Maybe I’d actually have a shot at winning the games too! My kids LOVE Mario and friends. This would be a great addition to our family game nights. I grew up playing Mario games and our whole family loves playing wii together. This would be a refreshing new game for us, aside from Mario Party 8 which our usual game of choice. I would so love to win this because we just got a Wii and would love to have some new games and we love Mario games. This is so cool thanks for doing this giveaway. I like Mario and sports, this would be cool to play. Simply because my kids are creamating me at Wii Sports resorts…and Im tired of fruit slicing duels.. I would love to win because my whole family would have so much fun playing this and Mario is one of my favorite games. Because we haven’t bought a new Wii games for years! 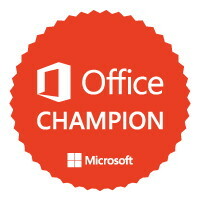 I’d like to win it because it will keep us active and engaged during the long winter weekends! I want to win this because we moved to Illinois in August. It’s been 10 years since I last lived anywhere that has a real winter. We have snow days here, and I have 3 children. I NEED this game!!!!!!!! Or, I need to move back to a warm, sunny location, so I can send them outdoors. I’d love to win this for family game night. My son loves games we can all play together. My son loves all things Mario! And… his birthday is less than a month away. What a great gift. I would like to win this game for my daughters. They dont have very many Wii games. My children would absolutely love playing this. We are on a tight budget…so, we have not purchased any new games for our Wii in over two years!!! This would be a great gift…..and a great way to burn off some energy on these cold, rainy days!